What is the robots txt generator tool? The robots txt generator is an online tool that generally available for free of cost. You just need to know the URLs that provide this service. For the convenience of users, there are many reliable robots txt generators. Most of the tools have almost similar functionality; however, the speed of generating file and ease of accessibility may differ. Now, it’s time to know what exactly this tool meant for? To know it in detail, you must understand that there is a root folder every website that contains customizable data. Only the developers of a website allow SEO experts to add a specific file to it. The websites are generally constructed on HTML or PHP, but this is a normal text file. Experts place this file in the root directory of a website. As mentioned above, the search engines spread their bot crawlers to check every corner of a web page in order to pick the content for ranking purpose. However, all fields are not useful or sometimes you don’t want to expose sensitive data to the search engine crawler. The webmasters use robots txt file to instruct search engine crawlers for skipping some specific web pages. These pages might contains graphical representation or PDFs that are not necessary to be crawled for indexing. Robots txt file is mainly to understand the search engine which pages to index and which pages not to index. The job of the spider is to crawl every web pages up to the website and take necessary steps for the search engine. Help Tool: Robots Txt Tester - This Tool will help you check robots file working properly or not. Why we need robots txt generator tool? If you want to get the answer that why do we need robots txt generator tool, first, it is important to clarify the search engine indexing. It is an automated process by the search engine for collecting the data, parsing it and storing data. The search engine giants like Google & bing collect and stores that that place is called search engine index. This data storage is very important for search queries results and ranking of a web page at a specific position of the search engine. If the webmaster will not index a website, the search engine takes a lot of time to execute the process of crawling including all sections of the website whether they contain targeted keyword for ranking or not. In this way, Google crawler speed will slow down that badly affect your SEO ranking strategies. The robots txt generator is a tool that produces a file for the root directory of a website. This file contains a set of instructions for the crawler to consider a specific area of web page leaving the sensitive and unnecessary area. The crawler collects data much faster than usual to keep your targeted site ahead in the competition. Why robots txt file is important for SEO? From the perspective of Search Engine Optimization, the robots txt file play a significant role. The text file is a robots exclusion protocol that instructs the crawler what to pick and what to leave for indexing. The term indexing means collection and storage of data for reflecting a website on various ranks of search results. Crawling is essential for every website to optimize a website according to the search engine’s parameters. However, it is not necessary to crawl all of the web pages. You just need the area for indexing that contains keywords of ranking. The entire focus of SEO is to rank a web URL on the top of the search engines list. If the crawler takes too much time for indexing, it will imply a negative impact on your ranking. In order to rank at the top and faster, it is important to set some restrictions on a crawler to index a page. Search engine optimization comprises a set of different strategies and tools that combine together in order to improve the ranking of a web page. As an SEO expert, it is your duty to find the most advanced and productive tools for monitoring real-time performance and concluding the most effective strategies. Just like keyword search indexing tool, you must have the knowledge of robots txt generator. This is a file of .txt format containing special instructions to the search engine crawler. There are lots of search engines like Google and Bing that continuously crawl on web pages in order to identify the text. This article will give you detailed information regarding robots txt, its generator, and advantages for SEO experts. 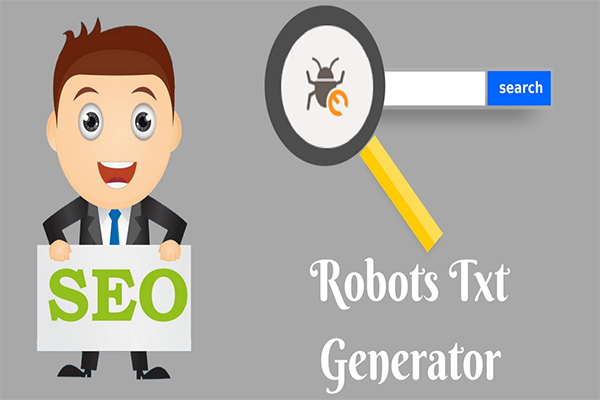 How to use our robots txt generator tool? In the first field, you will be asked whether to allow or refuse all robots. Allow it. In the crawl delay section, different time spans will be mentioned from 5 seconds to 120 seconds. As a default setting, no delay is selected. If you have a sitemap link, paste in the third field. If not available, leave it blank. In the below section, you need to select the search robots of different search engines. Good robots txt generator mention all popular search engines including Google, Bing, Yahoo, Baidu and MSN in their list. Select your targeted search engine and allow its mentioned fields. For instance, allow Google image and Google mobile if you are generating robots txt generator for Google search engine ranking purpose. After you select the search engines by allowing and refusing the fields, move to the section of restricted directories. Here you need to enter the restricted directories having a path directly related to the root directory of a website. When all values will be entered, click on “Create Robots.txt”. The file will be generated that you can add in the root directory for restricting a specific field. In the online form, you need to understand all sections before generating a file. Below are some sections that require a brief introduction. The default robot tags section is meant for allowing or disallowing all robots to access the files of your site. It is customizable from the options of search engines. During the crawling process by search engine bots, you can set some intervals. If you set the timer between 5 to 120 seconds, the crawler will take a specific timespan for executing the process. In the section of search robots, you will find various sections with options including default, allow and disallow. The allow command means granting permission to a specific search engine for accessing their robot crawlers. Similarly, the disallow command is meant for restricting a specific search engine’s robot to crawl. The sitemap of a website is not only meant for user’s navigation but also helps a search engine to navigate the site. If your website has a sitemap, it will be convenient for a crawler for indexing. How to block files, folder, unwanted pages, and broken pages? First, you need to log in with an ID of google webmaster tool. Here the tester will appear where you can allow or restrict a specific page. Simply, disallow the URL in order to block it. The same procedure is applicable for all files, folders & broken links. There are some online tools to identify the broken links of your site. Run a test to check them and block with the help of a webmaster. 1) Hide directories: For this type of situation if you don't want to make visible directory lively, just specify the directory name. So that all the files in the directory are completely blocked by search engines. 2) Disallow pages: If you want to hide or block particular pages, just specify the path of the page disallows. Once you generate the robots file, just copy the code and paste in the robots.txt file. Upload the robots.txt file in the top root directory of hosting. Where to upload robots txt file? Once you generate the robots .txt, the next step is its submission. Validate the robot code by entering the URL of your website. Once it is done, copy the entire text and paste it in a .txt file. Now, visit the root directory of your website through webmaster tool and add this file. After the submission, the crawler will start working exactly as per the instructions of the .txt file. In simple way is you need to upload robots txt file (robots.txt) in the top root directory of the public HTML file. When search engines crawl the web pages it first finds robots.txt files and takes action accordingly to the direction of the robot file to index pages in search engines. The main advantage of this tool is for SEO executives in order to rank faster. In this competitive environment of online business, everyone run behind the tricks for fast ranking and this is the proven solution. It is helpful in maintaining the privacy of user data to an extent. The crawler of the search engine gathers information from all sections of a web page. You can restrict it to collect data from a specific sensitive field. By disallowing the crawler, you can also hide some pieces of information that must not be highlighted but essential for the website in order to engage their visitors. This is the detailed information of the robot.txt generator and its importance in search engine optimization. All digital marketers need this tool if they are expecting fast ranking results with ethical strategies.